Approximately 14 years ago, my predecessor, Brian Shaw commenced the process of increasing awareness of the barrier that was Sevenacres Weir. This dam once had a fish pass on the left bank but that had collapsed many years ago leaving little prospect of salmon and migratory trout ever reaching traditional spawning grounds upstream. The dam itself was constructed at least 161 years ago as far as we can ascertain but perhaps long before that. We continue to press for improvement without success until the Water Environment Fund became available through SEPA and their team of specialists took an interest. Since the initial discussions took place around 3 years ago, we and SEPA have worked to bring about improvements at the dam and at last we have light at the end of the tunnel. With contractors on site at Sevenacres on the Lugton Water for the last few weeks, we paid them a visit this morning to discuss progress and to see if they had managed to resolve some of the water management issues that were causing delays. This is a hazard of working in rivers near the end of the season but nothing happens quickly in rivers and by the time all the contract requirements were sorted out and we went to tender, it was always going to be a difficult time to get the work done and manage water levels before spawning season. We haven’t yet found a way to control the weather but I understand the Russians may be working on this (or at least the Donald says they are)! 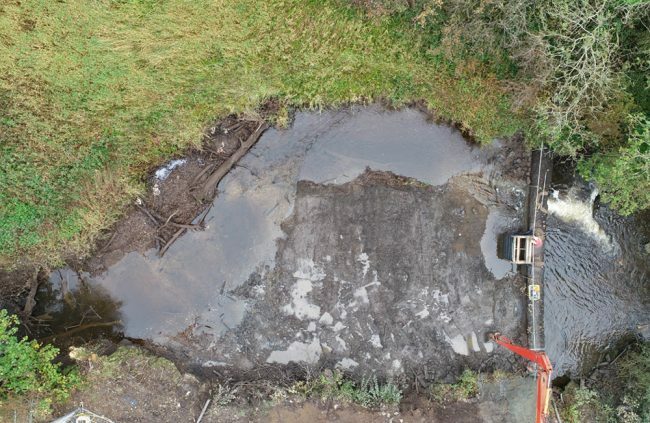 Robert Muir, Covanburn’s site agent had managed to finally solve the problem by finally digging deep enough to find a simple wooden and concrete plug blocking the original construction bywash. This was removed allowing water to flow at the base of the weir. Additionally, a core was removed through the dam face to allow surplus water to flow. 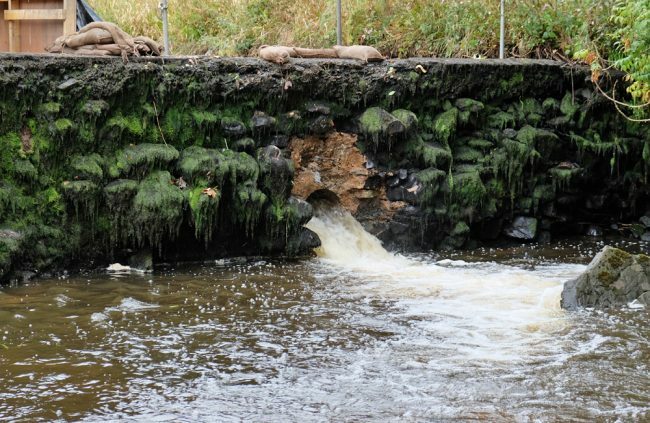 This of course will be reinstated fully on completion but it makes for an interesting temporary fish pass…something akin to the Darvel Dam hole in the wall on the upper Irvine. The solution that allows water levels to be kept in check….this along with the original scour pipe just out of shot on the left. 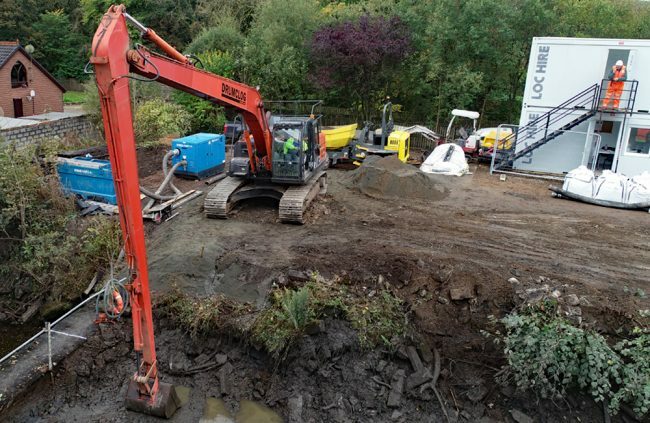 Now that the sediment removal has been completed, this long reach excavator will be replaced with something more manoeuvrable on the site. With this perfectly circular core removed, this allowed the flow to be diverted through the dam and the island area dewatered. The island has now been removed and the long reach machine was being replaced today with a more traditional tracked machine. The temporary dam will be installed tomorrow and shuttering joiners will be on site commencing construction of the fish pass shuttering. Progress is being made and Covanburn although slightly behind schedule, still expect to make up lost ground by increasing the workforce on site. The dewatered site where the island once lay behind the weir. 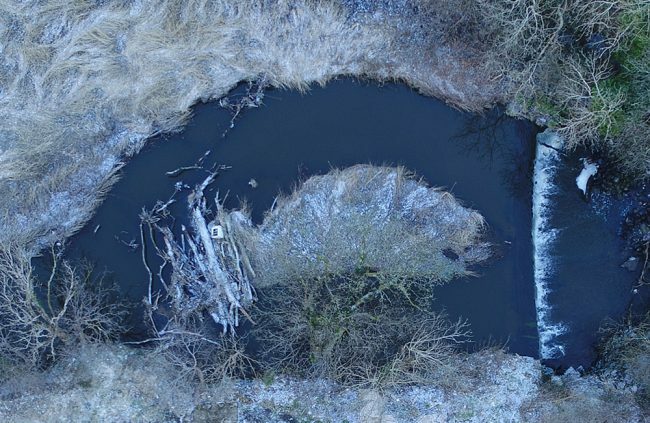 An accumulation of fine sediment and timber had built up and more recently discarded white goods littered the river trapped behind tonnes of logs. 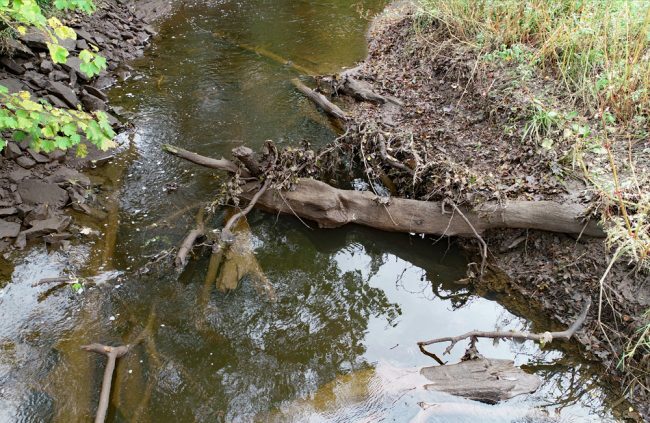 There’s still a few trees lying upstream of the dam and while we don’t like to remove large woody debris without good reason (as it offers great benefits to fish and invertebrates), in this instance, they may be best removed when we have the opportunity. We will check with SEPA and take their advice. Once the temporary coffer dam is in place, the work area should remain dry allowing the excavations and shuttering to continue. It shouldn’t be too long until we start to see the fish pass rising from bed of the river. I’m looking forwards to seeing a salmon and trout or two heading upstream. We’ll keep readers updated as work progresses. It has been a long time coming but we are delighted to see work progressing and I’m sure most readers will agree that the Trust can and does make a huge difference when funding is available.